Harvard negotiators proposed that student workers retain the right to choose whether they join the University’s newest union and pay union dues in a bargaining session with Harvard Graduate Student Union-United Automobile Workers Wednesday, a provision that would be unique among Harvard’s union contracts. The proposal drew fierce criticism from union organizers, while the University maintained the provision was meant to protect Harvard’s educational mission and its students. Former National Labor Relations Board Chairman William B. Gould IV characterized the University’s position as an “open shop” proposal and the union’s position as an “agency shop” proposal. An agency shop arrangement — which is typically achieved by including a provision known as a “union-security clause” — would require all student workers to pay dues to cover the cost of bargaining, according to Gould. An open shop arrangement would give student workers the choice of whether or not to pay dues. 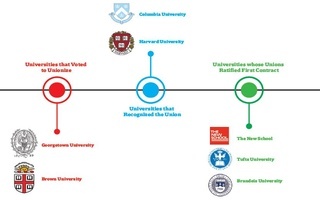 All of Harvard’s other union contracts follow the agency shop model, as do contracts between other private universities — including New York University, Brandeis University, and Tufts University — and their graduate student unions. HGSU-UAW proposed a union-security clause during its first bargaining session with the University in October, according to Rachel J. Sandalow-Ash ’15, an HGSU-UAW bargaining committee member. The union security agreement was meant to ensure that “all student workers who work under and benefit from the contract share the cost of representation fairly and equally,” Sandalow-Ash wrote in an emailed statement. “The administration’s proposal would limit the union’s resources and hurt student workers’ ability to effectively assert our rights and support each other,” she wrote. The union’s proposal, Swain wrote, would require all students to join the union and pay dues, or be subject to a fee equivalent to the dues. Otherwise, they may face consequences. “If they did not do so, they would be subject to termination, which for some student workers would make it impossible to complete their academic program,” Swain wrote. 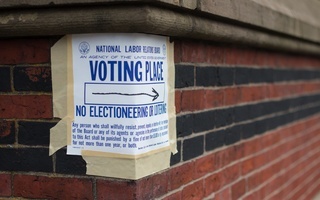 University Provost Alan M. Garber ’76 previously articulated the University’s intention to separate academic and labor matters in union negotiations in an email sent to Harvard affiliates prior to the start of bargaining sessions. “We will not agree to terms that will compromise our educational mission,” Garber wrote in the October email. 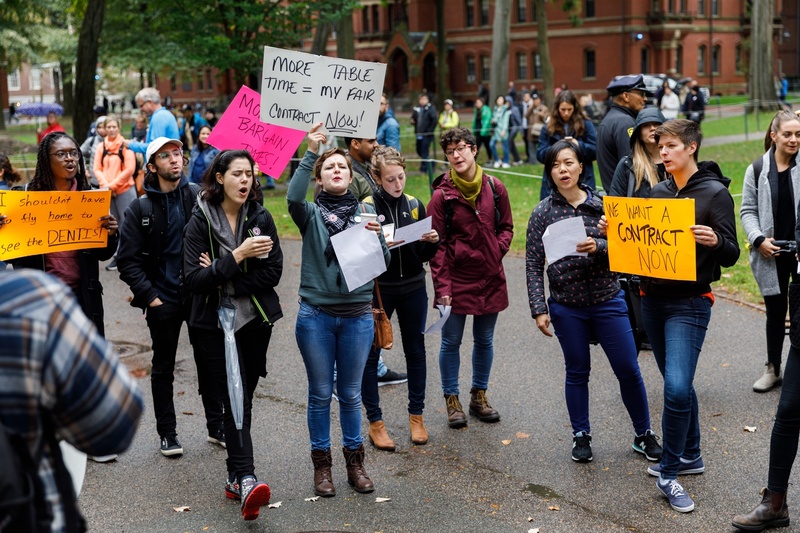 Carrie Barbash, the president of the Harvard Union of Clerical and Technical Workers, wrote in an email that while she is not familiar with the details of the University’s proposal, she is “strongly opposed” to an open shop arrangement. Swain did not respond to a question about the differences between different unions’ contracts. Gould suggested an alternative to terminating student workers who do not pay dues or fees: The union could instead impose other types of sanctions, such as arbitration or judicial proceedings. “It might be a good compromise to allow the union to avoid having free riders while allowing dissenting students to complete their education,” he said. The University and the union also continued negotiating other topics Wednesday, including health and safety provisions and a sexual harassment and nondiscrimination policy for which the union has repeatedly asked. The union’s proposal calls for workers covered by its contract be able to pursue third-party arbitration for sexual harassment and discrimination complaints. The University proposed in response that HGSU-UAW representatives be appointed to committees that could recommend changes to the University’s current Title IX policies. The union’s proposed procedures would address instances of discrimination and harassment not covered by Title IX, Sandalow-Ash wrote. “Under our proposal, student workers would have the right to choose how to pursue their claims of discrimination and harassment – through internal university offices, through the union grievance procedure, or both or not at all,” she said. Wednesday’s bargaining session was an additional session added to the regular bi-weekly bargaining schedule in place of a session cancelled due to winter break. The next bargaining session is scheduled for Feb. 4. Due to an editing error, a previous version of this article incorrectly stated Gould did not provide examples of other types of sanctions a union could impose if a student worker did not pay dues or fees. In fact, he suggested methods such as arbitration or judicial proceedings.